If you have skin sensitivities, allergies, or chronic conditions, you need a detergent that allows you to achieve clean, bright clothes without sacrificing your health. Laundry should be easy right? You throw the clothes in the washer, add detergent then toss them in the dryer praying you don’t have to iron them. But hang on a second…..laundry may be easy and unavoidable, but it’s not always safe for our skin or our health. 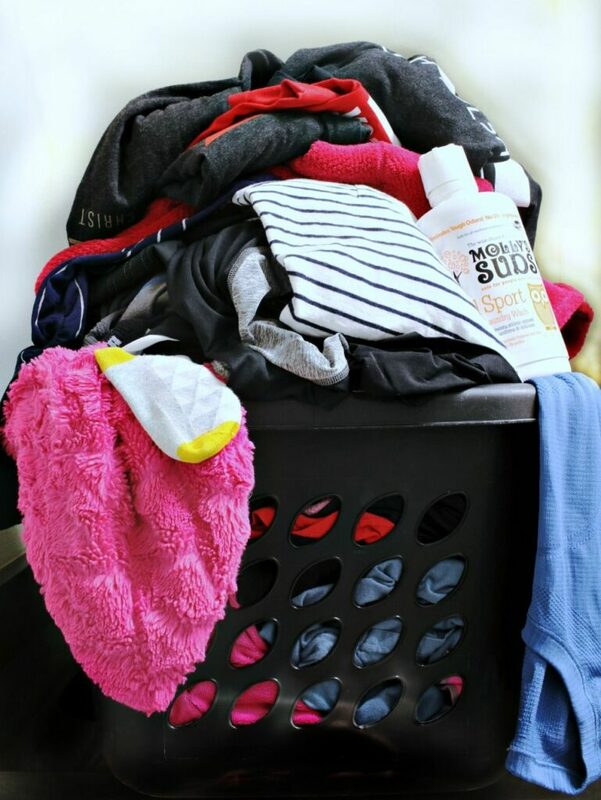 With a growing number of allergies, sensitivities & health conditions, we need to look for the best natural laundry detergent to get our clothes clean while keeping our planet safe. Regardless of the old way of thinking, you don’t have to rely on harsh chemicals and overbearing fragrances to get clean, bright, and fresh laundry. 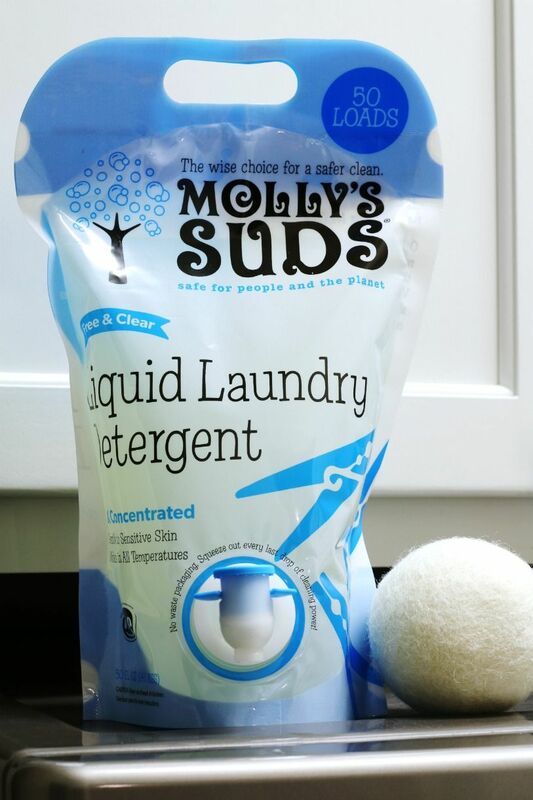 Many all natural, eco-friendly detergents such as Molly’s Suds are as effective as their conventional counterparts, with none of the dangerous ingredients. Less harsh chemicals, phosphates, and surfactants mean less opportunity for irritation, reactions, and rashes. People with sensitive skin and allergies (like my son & daughter) see huge benefits when switching to natural detergents. You don’t need to subject your skin to irritants when you have an effective and natural option. The best part of Molly’s Suds is its surprisingly short ingredient list. Their unscented laundry powder is comprised of 4 earth-based  ingredients: sodium carbonate, sodium bicarbonate, magnesium sulfate, sea salt…make it 5 if you use their Peppermint Powder. It really doesn’t get much more natural than that! 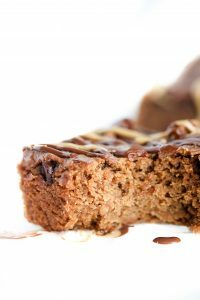 This short ingredient list is what likely earned Molly’s Suds a coveted “A” rating from EWG. Finally, a natural laundry detergent that works! I’ve been through a lot of natural detergents in the last few years but nothing ever seemed to work well enough for me to continue using it. I mean, I do want to save the planet & my family’s skin, but if if it doesn’t actually clean my things, then it’s not for us. With Molly’s Suds, my clothes are clean and fresh. The persistent “unclean” smell that plagued our workout attire when using other safe products were gone after one wash in Molly’s Suds. Do you see that washcloth above⬆︎, that’s full of my makeup. After using their Peppermint Detergent + Oxygen Whitener to our load of whites, it came out extra white and sparkly…ready to take on my vegan mascara once again! But it doesn’t end there. With All Sport, our daily workout clothes go in the wash sweaty & gross (thanks to Crossfit ‍♀️& Cross Country) only to be transformed into fresh & clean laundry. I really love this stuff & the fact that I can say “this natural laundry detergent works amazing”. 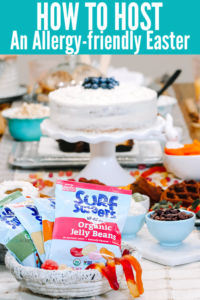 Because I love Molly’s Suds so much, I want you to try it for yourself! But wait, there’s more (kinda sounds like an infomercial, doesn’t it?). 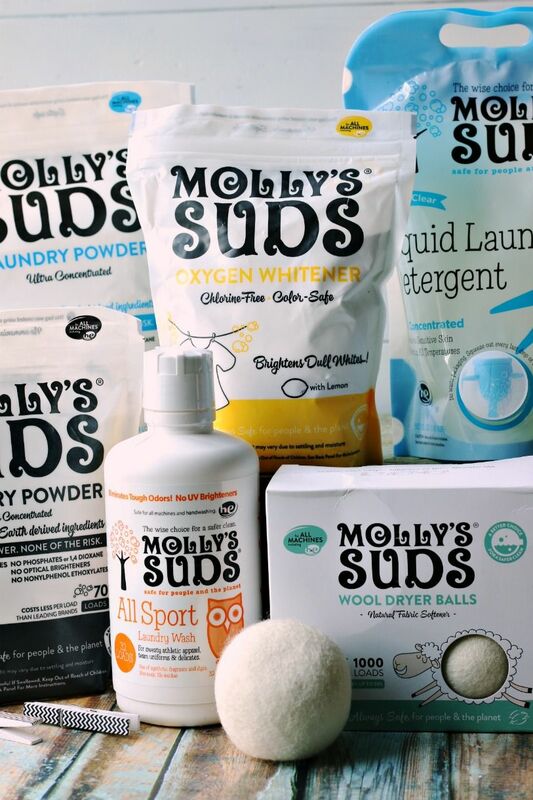 Even if you don’t win the giveaway, you can still win by using CODE “ALLERGYLICIOUS” for a special 25% off when you order Molly’s Suds natural laundry detergent directly on their website . You can also grab their Starter Set here on Amazon (but I don’t have a code for that one, sorry). Want to learn more about Molly’s Suds? A HUGE Thank-you to Molly’s Suds for partnering with Allergylicious to provide this amazing giveaway! 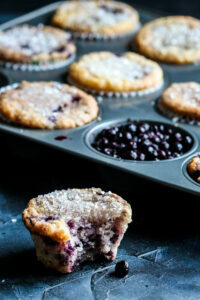 Collaborating with brands I love & trust allows me to keep bringing you new and varied posts, recipes & giveaways! As always, all opinions posted are my own. Thank you for your support. My only tip to do it consistently so that you don’t have three days worth of clean laundry piled up in your living room. Haha! So true Margaret. We have to do it daily just to stay on top off everyones messes. I wash everything in cold water. It saves tons of energy and it still cleans the same. That’s a hard habit to break but you are right, cold still cleans. Thermal energy, heat, is necessary. Bacteria dies at a certain temperature. Fungus (mildew, mold) at an even higher temperature. My favorite laundry hack is to put lingerie in the mesh bags! I found some specifically for bras, and it’s helped me get them clean yet kept their shape! I also like to compost the laundry lint! It’s great for my yard. I don’t have any great laundry tips, but I’m super interested by this brand! I have super sensitive skin and love that they offer free & clear. It looks like the quality is so much better than other natural brands, too. 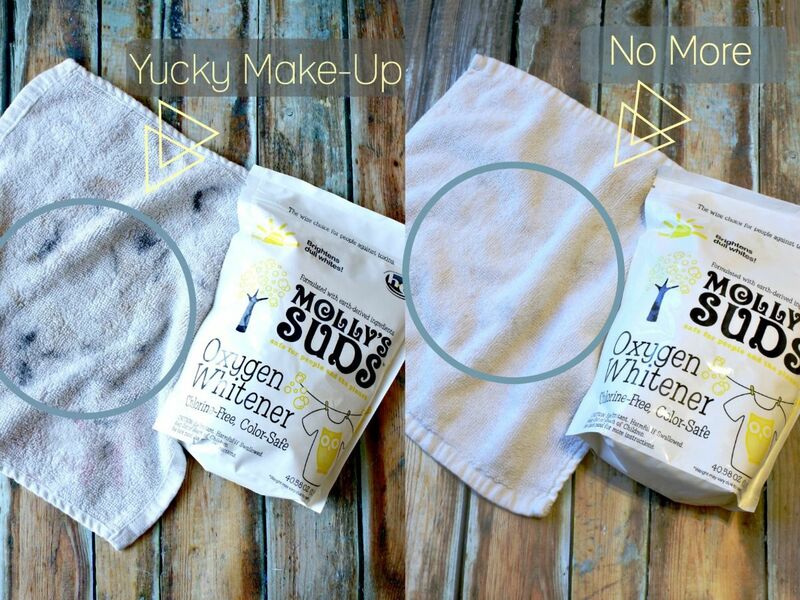 The biggest obstacle is wanting clean and fresh smelling clothes without all the chemicals. It is really hard to find a brand that does both of those things but I’ve so far had great luck with Molly’s Suds. My daughter even had a Lululemon shirt that never smelled cleaned and now it finally does. Follow the manufacturers tags, they’re there for a reason. using hairspray on ink stains! I have tried that! Works great. My best tip is to get things in the wash as soon as they’re soiled. Don’t let them sit around! So hard to do sometimes but you are so right! Thanks Chrystal! What’s your favorite product from MS? I try to do a load every other day to help keep the laundry from building up. With 3 little boys (and 1 big boy ) I’m sure you’ve got to keep up. I learned the hard way to use a mesh bag for baby socks and small clothing items! Oh bummer! I should have implemented that a long time ago with socks but then again, I don’t think my kids lose a sock before it even gets to the laundry room. Yes to better and safer detergent! I would love to try this product! Hope you entered. Only 2 days left! I think you’ll love this detergent (and if you like peppermint, their peppermint laundry powder smells amazing!). so, I need to find ALL of these things, ha! Right? If we can get the hubby’s on board, it makes things much easier. All mine cared about was “does it get the clothes clean!”. Hope you entered! Good luck. With my infant, I’ve been wondering if I should switch to something like this with her sensitive skin. I wish I knew about this when my X was an infant! 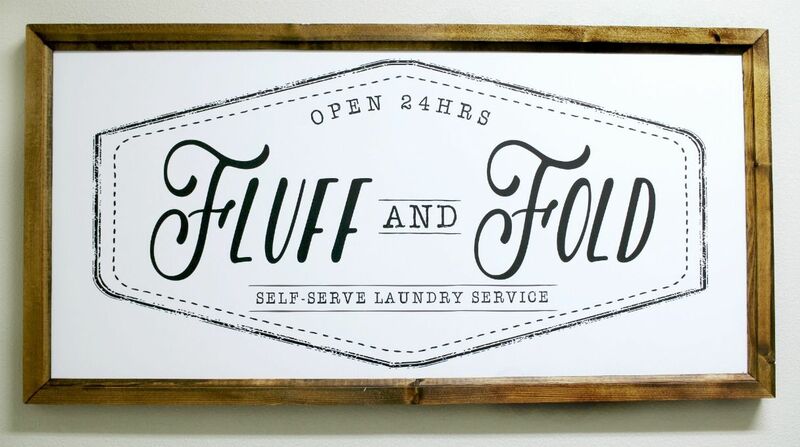 I would check it out for sure and they even have diaper laundry which you can use on cloth diapers and delicates. Use the discount code & enter to win. It’s worth trying for sure. I still for the life of can’t understand why people are cleaning with chemicals anymore. All the natural ones add years to your life instead of taking them away. 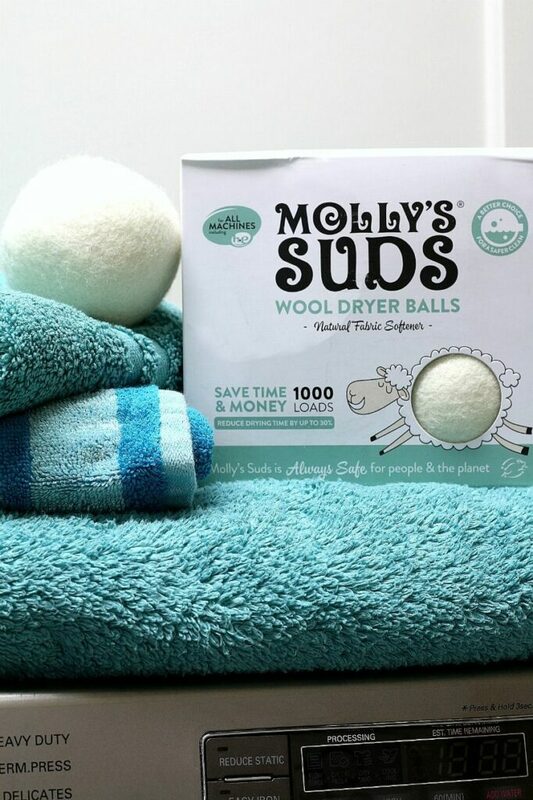 I recently learned about wool dryer balls and want to try them out. We love our Molly’s Suds! My daughter has become the keeper of the wool dryer balls when it is laundry day. So far, I’m extremely pleased with it’s performance. My tip is to shake the clothes out before putting them in the dryer. They dry faster and less wrinkled that just chucking the whole pile in at once. I haven’t tried Molly’s Suds yet, but I plan to! I suppose my tip would be to periodically wash the lint screen in the dryer. Just “scratching” off the lint doesn’t get it all. I always try to make sure to pre treat stains! Sounds like a good detergent.